One pleasant spring day, the windows were open, and hubby was spreading fertilizer in the pasture next to the house. The old herd bull was in this pasture because it was too early to turn him out with the cows, and there would be fighting, and likely injuries, if we put him in the feedlot pens with the yearling and two-year old bulls we were offering for sale. During springtime, bulls are noisy. The old bull loudly voices displeasure at being separated from the cows. He also wants to remind the young bulls that this is his herd. The young bulls are busy establishing their own pecking order through shoving matches alternated with vocalizations that range from deep, bass rumblings all the way to piercing baritone “moo”s. It was against this noisy backdrop that I participated in a conference call that was expected to last about an hour. I have a home office and participate frequently in these. About 10 or 15 minutes after the call started, I realized that the bull-related noise was different; much louder, and more aggressive than usual. I glanced out the window toward our feedyard. Everything appeared to be in order. The young bulls were shoving each other, but none had escaped or appeared injured. I returned my attention to the conference call, but soon realized that the source of the noise was close to the house…very close. I began to walk from window to window on the main floor, looking for a bull on the lawn. I was simultaneously taking notes for the conference call and confused over my inability to locate a very large, very angry animal. In exasperation, I leaned my head against our large, upstairs window. That is when I spotted the south end of a north-facing bull, He was pressed so close to the house, that I could not see him unless I was looking directly down toward the patio doors that led to the walk-out portion of the basement. Immediately, I headed downstairs to assess the situation. The scene that greeted me was unnerving. 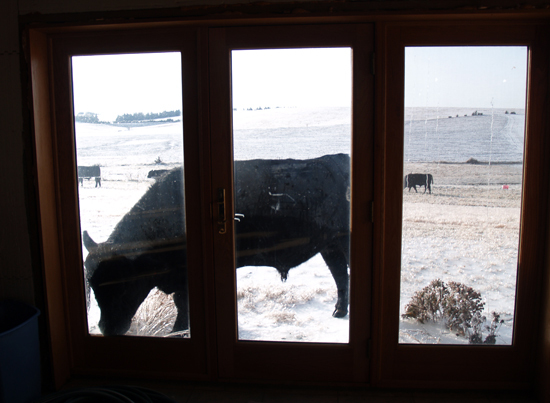 Through the patio doors, I could see a 2200 pound bull with his head lowered in an aggressive posture. He was using his front hooves to dig large holes in the dirt and toss it up in the air as a challenge. My stomach did flip-flops when I realized that he was challenging another bull to a fight. The only problem was that the other bull was, in fact, his own reflection in the window! This window seems to be a bull magnet. In this photo a curious yearling escaped from his pasture and is checking out the scenery. Imagine instead, an older, 2200 lb, very angry bull who sees a reflection that resembles a rival! I quickly passed off note-taking duties to someone else on the conference call, hung up, and formulated a plan. This bull was usually extremely docile and enjoyed treats (corn) in five gallon pails. I ran into the garage, found a suitable pail, and cautiously ventured outside in the hope that it would lure the bull away from my window. I called the bull’s name and shook the bucket to no avail. He was definitely not going to let my lame attempts distract him from defeating this magnificent new rival. At this point, I was totally convinced that there was going to be a bull crashing into my basement at any moment. I rejoined my conference call, and provided my coworkers with a great deal of amusement. The large divots dug out by the bull near the patio doors took a long to time repair as our puppy thought they were a great place to continue digging. And, husband now shuts the pasture gate even when he is only going to be there for a few minutes. Great story…this needs some major play in the media…I tweeted the story – I hope the media picks up on it. Reminds me of our Angus bulls – they would be calm except when the cows got ready. Thanks for reading and tweeting this story Doug! That’s a much funnier story when it happen to someone else. Still laughing. I will have to bookmark this page for the next time someone ask why I never wash a truck. Not that they don’t dent them up anyway but why ask for it. Yes, my coworkers definitely thought it was funnier than I did at the time! Thanks! Love it! We lease our bulls, but had to take delivery of them last week. Normally they’re not turned out until after July 4. Suffice it to say, they’ve wrecked the corral 3 times now. 🙂 And they do make a lovely racket! Thanks for sharing! Thanks for visiting! I love pictures you posted on your blog–especially the ducks and baby animals. I know its a bit older now, but I just got done reading your 10 things you’ll never hear a farmer say and I kept flipping through the posts and came across this one! Classic! LOL Thanks for sharing! Yes–this one is still one of my favorites! Jheem, Surprising the coincidence of your post of June 2011 about your bull. In July 2011 I had posted this about our old bull named Winston. He too was getting anxious to get to his cows after a full winter of abstinence, he knew how to lift the gates off hinges and escape.